Mr Hodari B. Davis is a long time student and teacher of African and African American History. Through extensive research, travel and study he has compiled much of what he has learned into lessons on Black History that he teaches in Oakland and for communities around the world. These lessons contain reframed histories and perspectives on the enslavement and colonization of African people on the continent and throughout the diaspora. These lessons are intended to provide guideposts for young people to learn and explore Black history and to pass that information, and knowledge on to others. This Black History Lesson designed primarily for Black History Month debunks some of the common stereotypes and myths concerning the Month of celebration. Some of the key elements include insight into Carter G. Woodson, perspective on Dr. Martin Luther King, and an introduction into the vastness of Black History. This Black History lesson is designed as a part 2, and carries participants through the challenges of Slavery and the related atrocities of the African Holocaust. Focused primarily on the experiences of African American people, key elements include examples of African resistance to enslavement, the extent of the brutality and suffering associated with the experience, and the colonization of our minds so we would not seek to know or understand what happened to us. This Black Herstory lesson focuses on the contribution and legacy of African and African American women in the struggle for the liberation of Black people. The presentation includes examples of extraordinary women throughout African American and African history. The lesson also includes a brief introduction to esoteric elements of Black psychology and explores ancient African concepts of the woman. This Black History lesson recalls the scholars of Afrocentricity, and Ancient African history who put our study of Black history into a proper context, and made a lasting contribution to the study of Black people around the world. Scholars include WEB Dubois, Dr. Dr. Dr. Cheikh Anta Diop, Drusilla Dunjee Houston, and a host of others. This Black History lesson focuses primarily on the African Origins of Civilization, tracing various contributions made throughout history by African people. Tracing 100,000 years of history, we look at the inventions of many technologies that we now take for granted like beauty, farming, and fishing. We also explore the African origins of humanity and civilization and its impact on world history. This Black History lesson focuses on the lost history of the Moors and their key contribution to the history of Black people. This deep dive into the events preceding the sail of Christopher Columbus and the start of the Atlantic Slave Trade, provides back ground context for much of the history and misinformation we are taught in American History classes, and ironically in colonial schools around the world. This dynamic lesson is highly charged because it unearths some historical fabrications and contextualizes the enslavement of African people in a new and uncomfortable way. This Black History lesson reveals 10 facts about Black History that helps to sum up the impact of African people on World History. The facts include information about the origins of humanity, the origins of Christianity and an examination of the impact colonialism has had on Africa and on the United States. Designed to be presented in Africa, this lesson uncovers motivations behind colonialism, aspects of European colonial history and photos of the aftermath. Mr Davis has traveled to 17 countries, taught Black History for over 20 years including stints at the first Black History Department in the United States, Merrit College, and the first High School Black Studies Department at Berkeley High School. 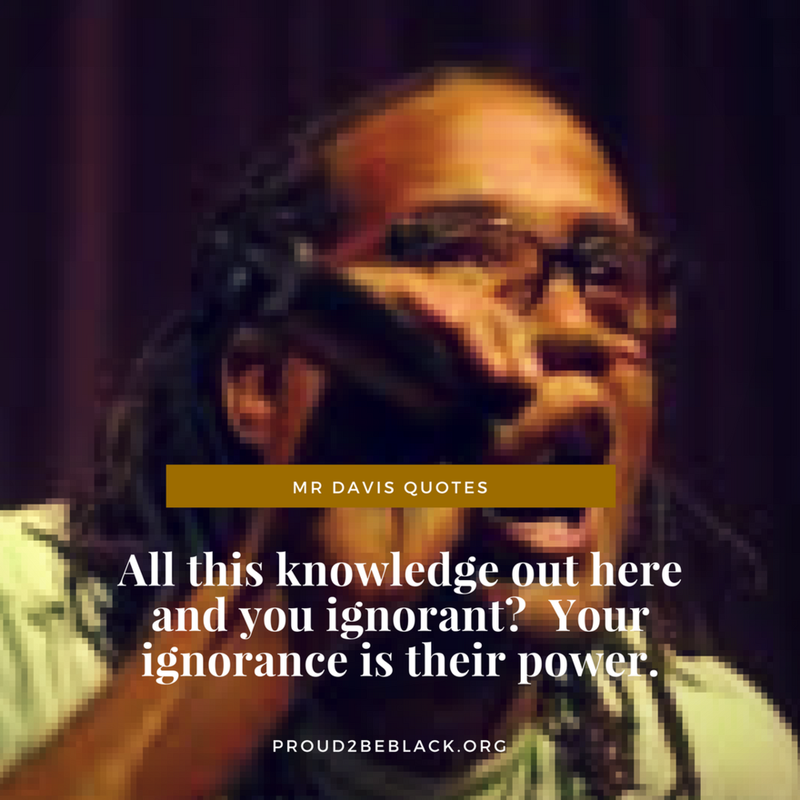 He has degrees from UC Berkeley and San Francisco State, and is world renowned as an organizer, activist, teacher, public thinker, event producer and poet.